According to a new market research report titled Electric Hub Drive and Electric Propulsion System for Combat Vehicle Market, published by Transparency Market Research , the global electric hub drive and electric propulsion system market is expected to reach US$ 103.04 Mn by 2026, expanding at a CAGR of 6.8% from 2018 to 2026. According to the report, the global market will continue to be influenced by a range of macroeconomic and industry-specific factors. Asia Pacific will continue to be at the forefront of global demand, with the market in the region growing at about 7.6% through 2026. Tracked type of military vehicle is anticipated to significantly drive the global electric hub drive market across Middle East & Africa. The global electric hub drive and electric propulsion system market shows significant growth due to its increasing adoption in military combat vehicles. This is majorly due to requirement of these highly developed systems in hilly areas and desert regions where high power is required to drive the vehicles. The global electric hub drive and electric propulsion system market is showing significant growth due to increase in military and defense spending. The rising demand and adoption of these advance technologies to obtain faster response, and the rising security concerns of different nations are estimated to contribute to the growth of the electric hub drive and electric propulsion system market during the forecast period. The key players involved in the market are continuously enhancing their research and development expertise to design advanced technology in electric hub drive and electric propulsion systems. Also, demand for light weight military vehicles across the globe has influenced the growth of the electric hub drive and electric propulsion system market. The global electric hub drive and electric propulsion system market is broadly segmented by technology, and by vehicle type. According to the research study, electric propulsion system technology held the maximum market share and is anticipated to show a CAGR of 6.9% through 2026. Electric propulsion system technology used in combat vehicles is anticipated to remain dominant over the forecast period. Electric hub drive type of technology is expected to grow at a CAGR of about 6.0% over the forecast period. As per TMR analysis, electric hub drive and electric propulsion system for combat vehicle market in tracked type of vehicles is anticipated to grab maximum market share in 2018 and a similar trend is expected to be seen over the forecast period. Increase in terrorist attacks is one of the major factors responsible for increasing security of countries across the world. As war disputes between enemy countries are increasing, more and more government organizations are switching to advance military vehicles with latest technologies to handle these situations and maintain national security. Further, the wheel type of combat vehicles is expected to show decent growth over the forecast period. 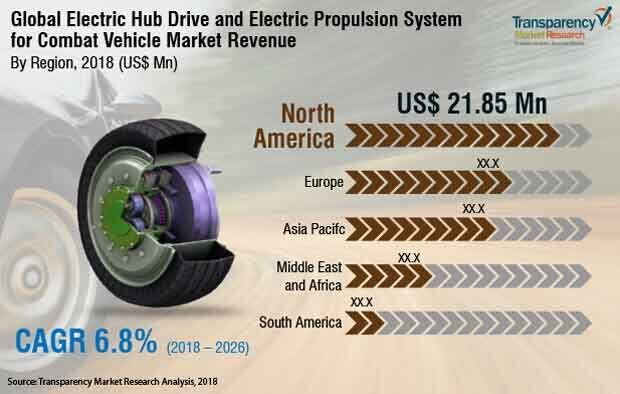 North America held the largest market revenue share of the electric hub drive and electric propulsion system market in 2017 and the market in the region is anticipated to grow at a remarkable CAGR of 6.2% during the forecast period. The need for fast acceleration and high torque and an inbuilt hub drive is expected to drive the electric hub drive and electric propulsion system market across North America. In the Asia Pacific electric hub drive and electric propulsion system market based on country, in 2017, China held majority revenue share followed by India. Also, in terms of revenue generation, the market in India is anticipated to grow at a healthy CAGR over the forecast period. Increasing security and defense expenditure by the countries is likely to create a lucrative market for electric hub drive and electric propulsion systems. The research study includes profiles of leading companies operating in the global electric hub drive and electric propulsion system market. Market players have been profiled in terms of attributes such as company overview, financial overview, business strategies, and recent developments. Some of the key players in the electric hub drive and electric propulsion system market are QinetiQ Group PLC, Aerojet Rocketdyne Holdings Inc., Safran S.A., BAE Systems, Magnetic Systems Technology, United Technologies Corporation, Raytheon Company, Rolls-Royce Plc, General Electric, and Northrop Grumman Corporation.